A Telescopic hedge trimmer may be the answer if you have very tall hedging and you want to do your garden maintenance yourself without calling in an outside contractor. You may be thinking that you do not want to be climbing a ladder because of safety risks and you do not want to go to the expense of purchasing a cutting platform that you might find cumbersome to move around your garden or to set up safely if the ground is very uneven. Purchasing a machine especially designed to cope with this type of hedging is a good solution to the problem. These are sometimes referred to as long reach or pole type but are more often referred to as a telescopic hedge trimmer in the UK. The great benefit of these is that they allow you to cut high hedging and shrubbery whilst keeping both feet safely on the ground! The key feature to look for in this type of machine is to ensure that you get one with what is called an adjustable cutter bar head. What this basically means is that you have the facility to angle the blades to the handle and it allows you to cut along the top in a neat line or to shape the tops of shrubs yourself. When considering purchase of a telescopic hedge trimmer, make sure that you get a model that is well balanced. The longer length of the machine which is essential to get the job done, also means that it does become rather unwieldy in use and difficult to manoeuvre. Choosing a machine which has the centre of gravity just right will make it so much easier to use and much less of a strain on your back and shoulders. Of course, if you are buying online, you cannot actually try the machine out for yourself but you can email the dealer for recommendations or look for user comments elsewhere on the web. This is a good way of researching as you often turn up problems that are not mentioned anywhere else. Another thing to remember when cutting above your head is not to try to force the blades through branches that are too thick for it to cut safely. You will have major problems if the blades get jammed in the branches way above your head and it is just not worth the hassle of trying. 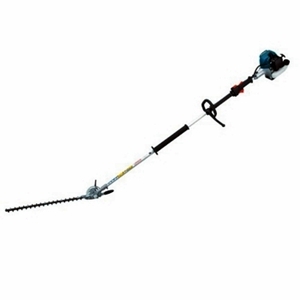 No telescopic hedge trimmer is designed to be used as a chain saw and trying to cut through thicker material than your machine is designed for could easily result in an accident.What you should do is to use some manual pole loppers to cut off any thick growth before you start. These tools are inexpensive and very effective and get the job done quickly so you can whizz through your cutting and tidying without having to stop. If you find that even with a telescopic hedge trimmer, you have to climb up a ladder for an exceptionally high or awkward area, just take a moment to assess the hedging you are going to be leaning your ladder against. If there is any possibility that the ladder could fall through (which is definitely what you do not want to happen whilst you are working at a height with a power tool in your hands), you can resolve the problem by lashing a plank of wood at right angles to the rungs of your ladder at the top. This makes a T shape of your ladder and makes working much safer. Although the video below demonstrates an electric telescopic hedge trimmer, it demonstrates the features beautifully – take note particularly of the adjustable cutter bar head which allows you to cut along the top from the ground and makes trimming the underside really easy too.